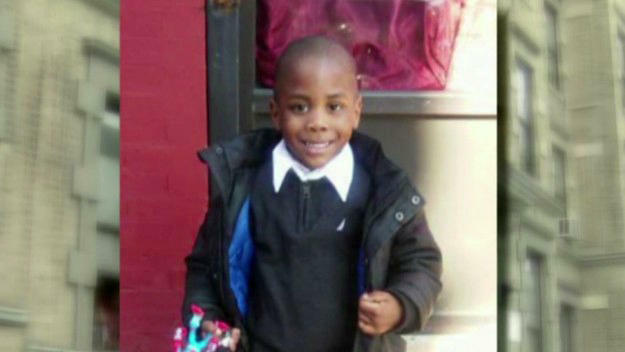 NEW YORK -- Three New York City Administration of Children and Family Services workers were fired Tuesday, and the city accepted a state order for an independent monitor after a scathing report on the agency’s handling of a 6-year-old Harlem boy who died, CBS New York reports. The report issued by the state Office of Children and Family Services detailed five complaints of abuse and neglect that ACS investigated involving Zymere Perkins. It followed a report on the investigation that was issued by ACS itself. Zymere died on Sept. 26, and the New York City medical examiner’s office ruled that his death was caused by fatal child abuse syndrome - meaning Zymere had evidence of acute and chronic abuse in the form of fresh injuries and old scars. The prior complaints were filed between June 22, 2010, and April 18 of this year, the state said. The ACS complaint reports contained repeated claims of drug and alcohol abuse by Zymere’s parents, excessive corporal punishment and inadequate guardianship of Zymere by his mother and her boyfriend, the state said. “The level of casework activity for all cases was insufficient and was particularly lacking given the family circumstances,” the state report said. Zymere’s mother, 26-year-old Geraldine Perkins, and her boyfriend, 42-year-old Rysheim Smith, have been charged with child endangerment. The state report concluded that ACS “did not conduct thorough investigations and/or follow regulatory standards” and said there were “specific points when timely and appropriate intervention could have assisted the family’s functioning” but did not happen. The state said ACS conducted “interviews of poor quality,” did not correctly assess issues such as possible domestic violence and mental health problems within the family and failed to investigate properly in numerous other ways. Gov. Andrew Cuomo ordered the state investigation in September, and following the probe, the state on Dec. 1 ordered ACS to appoint an independent monitor that the state must approve, the state said. The report said Mayor Bill de Blasio accepted the order on Tuesday. De Blasio added in a statement that three ACS employees involved in Zymere’s case have been fired and the city has also moved to suspend and demote six more employees. The state report detailed and sharply criticized the handling of each prior ACS complaint. On April 18 of this year, ACS received a complaint that Zymere had arrived at school with multiple bruises and scratches on both legs, the state said. The school nurse noted that he seemed to be in pain, the state said. Zymere claimed that he had fallen off his scooter and that his cousins had been hitting him, the state report said. Zymere was taken in for an interview with an ACS detective, and his mother was overheard asking him if he told the ACS staff “the truth,” saying the school would “back off” if he did, the state said. The mother also denied abuse allegations and claimed that Zymere had been with a maternal aunt in Brooklyn, the state said. But ACS never followed up with the boy’s aunt, and after Zymere died, maternal relatives said they had not seen him in months, the state said. Zymere also said he was spanked when he did not behave, but the ACS specialist who interviewed him never asked who spanked him, the state said. On Feb. 2, ACS received allegations that Zymere was being abused by his mother and her partner, the state said. ACS received a report that the boy had a broken jaw in October 2015, and a short time earlier, he had been reported to have scratches near his eye and a tooth knocked out, the state said. Zymere’s mother said each injury was caused by a fall and said he was “clumsy and falls a lot,” the state said. ACS dismissed as unfounded the allegation that Zymere had suffered a fracture on the grounds that a “medical professional” had determined that he did not have a broken jaw, the state said. The claim came from Zymere’s mother, and ACS never tried to contact the medical professional, the state said. In an earlier report, Zymere told ACS that he was beaten by his mother’s partner with a belt and “went back and forth” with claims that he was put in a cold shower as punishment, the state said. ACS also received reports in June 2015 that Zymere’s mother’s partner hit him 20 times on his buttocks and legs as punishment at a picnic, the report said. ACS interviewed the mother’s partner in 2015, and he admitted that he assisted the mother in disciplining Zymere, the state said. He denied placing the boy under a cold shower but said he would take Zymere to a store, show him toys and tell Zymere he couldn’t have any of the toys because was “being bad,” the state said. ACS substantiated a claim of inadequate guardianship over the use of cold showers as discipline, but unsubstantiated a claim of excessive corporal punishment by Zymere’s mother for reasons unexplained, the state said. The state said ACS never added an allegation of emotional abuse based on the other “cruel methods of ‘discipline’” that were alleged. Zymere’s mother first came into contact with ACS just after he was born in 2010, when she tested positive for marijuana after giving birth, the state said. But Zymere’s toxicology report was negative and the medical staff indicated her marijuana use did not affect him, so the report was dismissed as unfounded, the state said. In October, Carrión broke down in tears during a City Council hearing regarding Zymere’s death. “Losing a child is unbearable, and it’s my responsibility, and one that I take seriously,” Carrión said at the Oct. 31 hearing. The mayor’s office said Carrión was not asked to step down. De Blasio on Monday explained the criteria for finding the next commissioner. Carrión will stay on until a replacement is found, the mayor’s office said on Monday.